On behalf of CIS-A2K team Subodh Kulkarni conducted a Marathi Wikipedia Edit-a-thon at Shivaji University in Kolhapur on 15 December 2016. 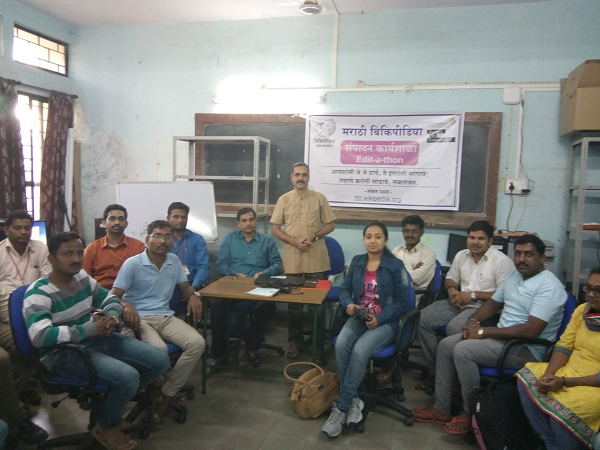 The goal of the Wikipedia edit-a-thon was to build resources in the field of Political Science on Marathi Wikipedia and equip its participants with the process of contributing to Wikipedia, and to introduce it as a concept to them. The workshop was conducted at the Political Science Department of Shivaji University for post graduate and research students and professors. The Head of the Political Science Department, Dr. Prakash Pawar actively took part in all the process. In all 22 new editors began their contribution on Wikipedia. The effort is the first step towards building long term institutional partnership with Shivaji University where many courses are run in Marathi language. The Department of Mass Communication and the Department of Environment and Science have also evinced interest for conducting edit-a-thons for their students. To introduce Wikipedia as an encyclopedia for research and a concept to new editors. To Promote Marathi Wikipedia Community & promote the use of regional languages in Wikipedia. To have an open interaction within the editors, existing as well as new. To spread the awareness of Wikipedia as a powerful tool.